When is the last time you stopped to consider your habits? Change is a great opportunity to consider your habits. We recently returned from a month long stay in Germany. It was a great trip and I could easily write several blogs about the horses seen, people met, and country traveled. Maybe I will, maybe I won’t, that still remains to be seen…but if I had one ‘complaint’ about the trip it would be that I struggled with my internet connection. This was not directly an issue with Germany, just an issue with my chosen method of internet service. To make a long story short; the air card I bought didn’t want to play friendly with my computer and I didn’t ask for help when I was standing at the desk during the purchase. I spent the first week nearly hyperventilating because I wasn’t blogging and posting online. I was still doing things (meeting people, seeing sights) but in the back of my mind I was constantly fretting or feeling like I had forgotten something. Point number one: habits can be strong. During the second week I began to accept that I wasn’t going to be online much. I also realized that my fretting wasn’t changing the problem…but it was changing me. It is difficult to fully present and engaged with horses and riders if you mind is wandering to internet problems. Point number two: even good habits can be distracting. In the third week I realized that I had a choice to make; how much time would I dedicate to this problem? It was clear that thinking about the problem every half an hour wasn’t changing things. I decided that I would allow myself to consider the issue only once a day, after dinner. It was amazing how much more clear my thinking became once I had a ‘set time’ for considering my problem. It no longer consumed my thoughts and yet I hadn’t completely thrown it out. Point number three: you always have a choice. Habits are choices that we make every day. Although I initially considered my lack of internet connection to be a problem, I have now decided that it was a blessing in disguise. I think I connected more with people I was around. As a bonus I have also been more aware of all of my habits after returning home. This makes me wonder where other habits (good or bad) may be controlling me. Do you have riding habits that you want to change? 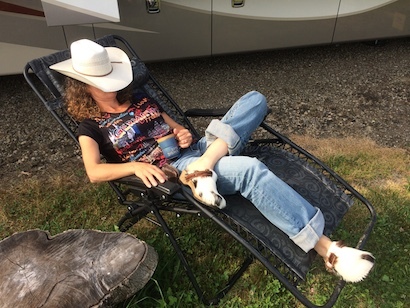 Do you have any riding ‘habits’ that are more like rituals? 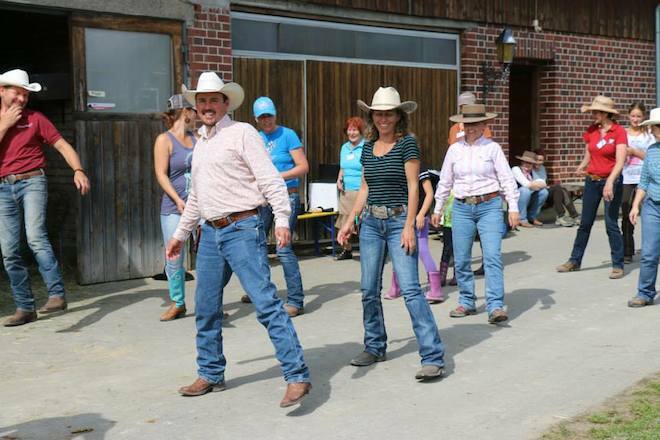 Line dancing while in Germany…instructions in German, I was laughing the whole time! P.S.-I did take notes and write some blogs while I was in Germany. I even got a chance to visit-AND RIDE- Roxy’s first foal, Roxter (aka Gee Whiz I’m Smart) who lives in Germany! I read about your internet problems and realized I had a habit of checking in almost every day to see if the problems had been resolved. I finally decided to relax and “let you enjoy your down time” (literally) A similar experience has been when my computer or phone has died (multiple times) and I have lost all photos and texts that I thought were important. Once I grieved the loss (akin to a cyber fire), the purge almost felt healing. Clean slate, start over! We learn what is really important….being present in the here and now because that is all we have for the moment. Blog when you feel like it, no pressure!! Love your analytical thinking process…..Missed your blogs! Just thinking about all the emotions you must have felt riding Roxy’s first baby… I’m so glad you got to have that connection with her while you we there. #2…. Glad you had a great time and are back! i am amazed at what an organized and disciplined thinker you are!